What does your company owe you? 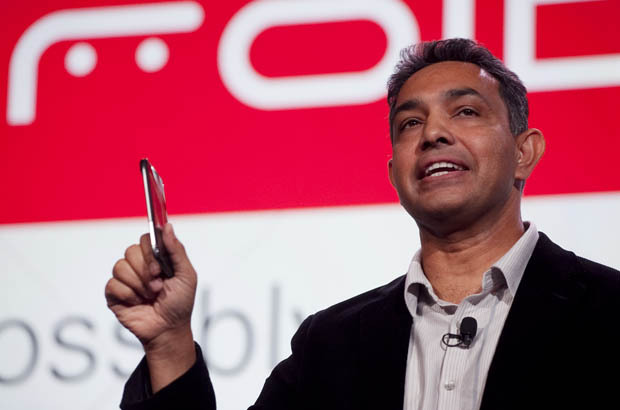 Sanjay Jha, former CEO of Motorola Mobility, holds the Droid Razr, in 2011 in New York. The company once made the best-selling phone in the world, but the rise of touch-screen smart phones hurt the company and its market share. Earlier this month Motorola Mobility, the once powerful cell phone maker that Google acquired last May, announced a 20 percent layoff of its workforce and the closing of over 30 of its worldwide offices. The reason for the decision was obvious: Motorola has been unprofitable for 14 of the last 16 quarters and continues to lose market share to Apple and Samsung’s smart phone empires. To paraphrase the words of Jerry Sterner in his brilliant play and film Other People’s Money, Motorola used to make a great product – buggy whips/flip cell phones. But no one needs or wants a buggy whip/flip cell phone anymore. Motorola/Google needed to reshape itself in an ever-changing marketplace. But what about the workers they displaced? What about their financial wellbeing? What about their futures? Unfortunately Motorola doesn’t owe their workers very much at all, legally or ethically. Oh sure, they owe them their pay to date and perhaps a severance package and possibly some classes in CV writing, but outside of a few legalities and some minimal niceties, that’s about it. Even though we may all want a repeat of the “Malden Mills” story, it’s not going to happen. In 1995 the Malden Mills plant (they manufactured Polartec and Polar Fleece sporting apparel) burnt down and its owner, Aaron Feuerstein, decided to pay the salaries of his employees while the plant was being rebuilt. Mr. Feuerstein became an instant national hero, but his example of kindness and generosity is not required – nor is it often duplicated – in the business world. Let’s be honest about how modern capitalism and big business works. A company sells product B, but when customers stop buying product B, for whatever reasons, a company’s responsibility to its employees changes, and in fact, effectively ends. Yes, while a business is in business it must and should ethically treat its employees well. Yes, a company should be concerned with the safety and wellbeing of its employees. Yes, a company should pay their employees a fair wage and should offer them reasonable perks and benefits. But according to Milton Friedman, a company that no longer produces a profit or a product that the public wants or needs is no longer in business, and all bets are off. No matter how much we may dislike it, no matter how much we regret it, business has only limited legal and ethical obligations to its employees. When new businesses or new ideas push out old businesses and old ideas, layoffs, downsizing and bankruptcy are a normal part of the game. I’m not saying it’s right, but it’s the way the world works. Al Gini is a Professor of Business Ethics and Chair of the Management Department in the Quinlan School of Business at Loyola University Chicago.